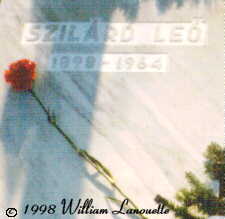 The Leo Szilard Centenary was celebrated in Budapest from 9 to 11 February 1998. On 9 February, an all-day seminar was held in the assembly hall of Eötvös University. On the morning of 10 February, a Centenary Session honoring Szilard was held in the Congress Hall of the Hungarian Parliament. The events were organized by Prof. George Marx, president of the Eötvös Physical Society. They were sponsored by the Eötvös Physical Society and Eötvös University, in cooperation with the American Physical Society, the Hungarian Academy of Sciences, and Pugwash. 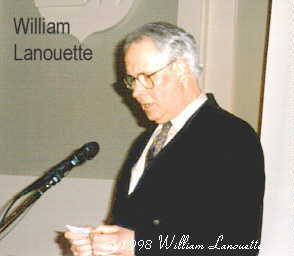 Attendance at the events was a tribute to Szilard's lasting influence. More than 30 years after his death, friends travelled to Budapest from far and wide to remember his legacy. George Litván recalled the Szilárd family from their Budapest days. John Silard described having Szilard as an uncle. Leonard Rieser and Ruth Adams remembered his work with the Bulletin of Atomic Scientists. George Rathjens talked about his efforts for disarmament. Nándor Balázs discussed Szilard's theory of aging. 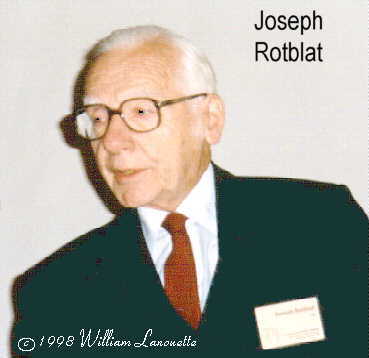 Joseph Rotblat spoke about his work with Pugwash. 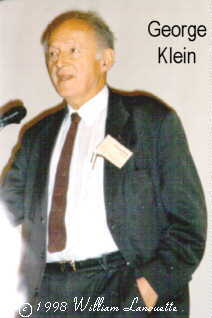 George Klein delivered an eloquent summation at the close of the seminar. For the full list of speakers, see the conference announcement. The Parliament provided a dramatic forum for the session on 10 February. The Parliament is one of the most beautiful buildings in Budapest. A banner on the speaker's podium in the Parliament featured a sketch of Szilard by Eva Zeisel. 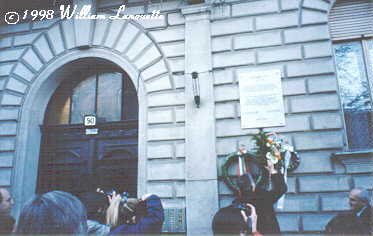 On the afternoon of 10 February, a commemorative plaque was dedicated on the apartment house on Bajza utca where Szilard was born and lived during the first four years of his life. The plaque was almost placed on the wrong building. A century ago, the building was number 28. Since then, the street numbering was changed. The building is now 50 Bajza. Luckily, the change in numbers was discovered a few days before the dedication ceremony. For the text of the plaque, see the website of the Hungarian Nuclear Society. On 11 February, half of Szilard's ashes were laid to rest in the Central Cemetery on Kerepesi út. The other half will be interred in Ithaca, New York, at the grave of his wife Gertrud Weiss Szilard. Marx, George (editor). 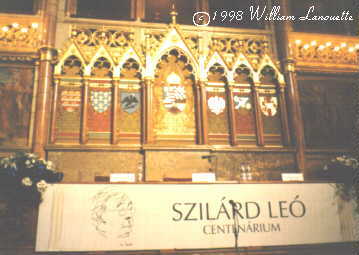 Leo Szilárd Centenary Volume: Lectures and contributions on the centenary of Szilard's birth, Budapest, on 9-11 February 1998. Budapest: Eötvös Physical Society, 1998. Paperback, 192 pages, no ISBN number. Copies may be ordered for $20.00 (U.S. Dollars) from the Eötvös Physical Society, P.O. Box 433, H-1371 Budapest Hungary. An article about the Centenary, "Budapest Journal: Hungarian Fingerprints All Over the 20th Century," by Jane Perlez, appeared in the New York Times on March 20, 1998, page A4. The article was reprinted in the International Herald Tribune, March 21-22, 1998, pages 1 and 5, as "Hungary Sadly Reflects on the Continuing Drain of Its Big Brains." This page is still under construction. Please come back again for more text and photographs.